Rick Wagoner To Step Down As GM CEO At Obama's Request! The NY Times is reporting GM CEO Rick Wagoner is resigning at President Obama's behest one day before unveiling his rescue plan for GM and Chrysler. March Madness? Ha! More like Carpocalypse Carnage! UPDATE! 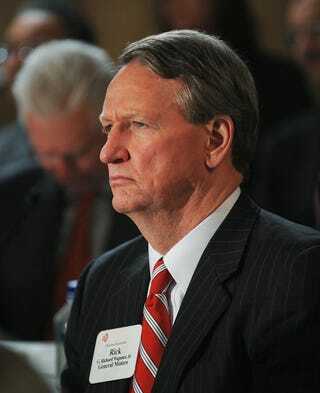 UPDATE: Politico's reporting President Obama asked Wagoner to step down. This is getting more and more interesting, ain't it? UPDATE #2: We're now hearing from a source at GM that Fritz Henderson will be taking over as CEO of the nation's biggest automaker. Frankly, Fritz ain't the worst choice to take over from Wagoner. To be honest, however, it's not like there's a whole lot of other choices out there. "Mr. Wagoner was asked, and agreed to, step down as part of G.M. 's restructuring agreement with the Obama administration, according to an administration official who spoke on condition of anonymity because a formal announcement has not been made yet. The unexpected move by Mr. Wagoner, who has been at the helm of G.M. for eight years, was not confirmed by the company. A statement about Mr. Wagoner's future will be issued after the president's comments, which is expected to be Monday morning." UPDATE #4: The Freep has a pleasant little photo gallery of GM executives through the years. It's almost poignant. Almost. UPDATE #5: Fritz Henderson will be appointed interim CEO after tomorrow's double-bump of press conferences.